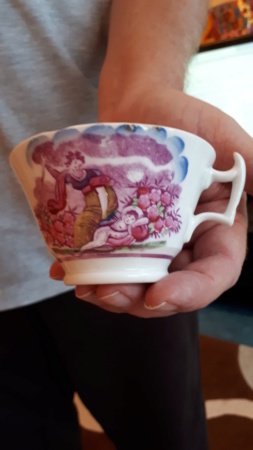 Does anybody know the age, make and pattern of this porcelain teacup? Thanks for that NaomiM I think your right. I've been researching the pattern and I think it could be the horn of plenty pattern as she seems to be holding something in her hand. Defintely by Hilditch, the cup shape is known as the "London shape". Many thanks user9318 for the information. 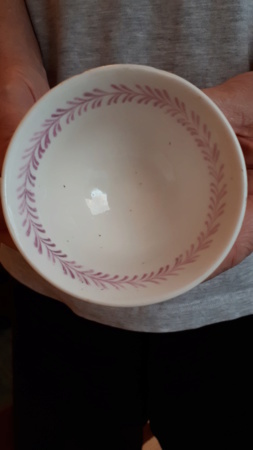 I have 2 cups of this patttern and both of them have a few nibbles on the edge and handle which I've assumed were done in manufacturing process as the nibbles are under the glaze and print. I was wondering whether you had noticed anything like this on yours? 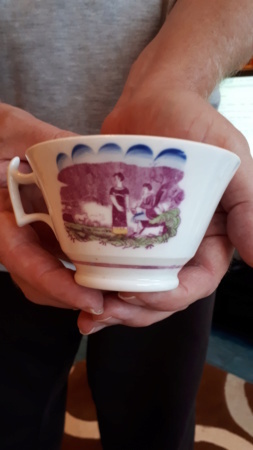 I have found the same on some of mine Pottyal and as Naomi says, it is lower quality, but I like the cup design, the patterns and colours. Sorry to be the fly in the ointment but I don't really agree with the Hilditch attribution. While Hilditch did use the London shape, that style was pretty common in Regency porcelain. Please correct me if I'm wrong but the band under the prints and the internal decoration are pink lustre which Hilditch rarely used; most likely another Staffordshire factory (I don't know enough about Sunderland lustre to make the suggestion). It's quite interesting to see the two different prints on either side which I would imagine would have made it more expensive to produce. The subject matter is typically Regency - you see examples of similar bat-printed patterns of mothers and children, reflecting a fashion for the art of painter Adam Buck. Finally, I'd have to disagree about the quality, Naomi. Hilditch for the most part produced middling quality teaware, better than many of their contemporaries. However, some of their later Rockingham Ware-style dessert and tea wares were comparable in quality to the best factories. They supplied to some of the top retailers according to the Hilditch Porcelain book.